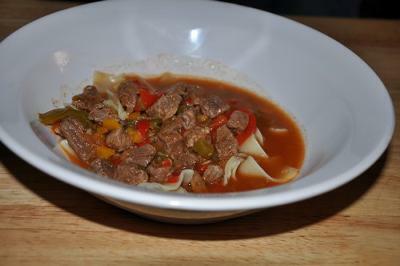 Basic beef stroganoff consists of steak or beef cubes in a tomato based sauce and usually served with noodles. 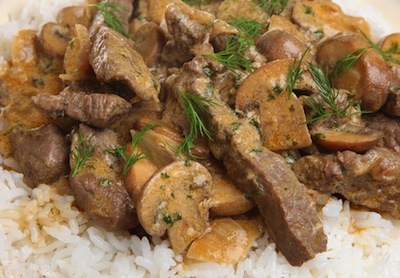 We have some of our favorite stroganoff recipes here as well as a fun variation for a stroganoff like soup from one of our readers. Our family loves this basic beef stroganoff and I really love it because it is easy and tastes delicious. Boil water for noodles while you are cooking the stroganoff. In a bowl, toss steak and 1/4 cup flour until well coated. Brown in oil in a skillet. Add 1-2 Tablespoons tomato sauce and add mushrooms. Cook several minutes. Add beef broth and heat until bubbly. Allow to cook 5-10 minutes until sauce thickens. Add sour cream. Serve with warm egg noodles or rice. ~Want to prepare this in the crockpot? Stir the beef and flour together in the crockpot. Stir in tomato sauce, mushrooms and beef broth. Cook on low 6-8 hours. Right before serving stir in sour cream. Serve over noodles. 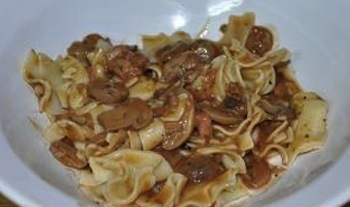 A quick crockpot version of stroganoff using canned golden mushroom soup. Place beef, mushrooms and canned soup in crockpot. Stir in water, onion and pepper. Cook for 6-8 hours on low. Serve with 6 cups hot cooked egg noodles. Ok My favorite soup is.... Hungarian Steak Soup. Me and my dad made it. My dad helped me make the steak. But other than that I mostly did everything. It is so good that you won't want to stop eating it. So here is the recipe. 1. Pat the meat dry. Trim away and excess fat and cut the meat into 3/4 cubes. 2. Cut onion in half and coarsely chop one half. Thinly slice other half. SET ASIDE! Core,seed, and cut each bell pepper in half. Cut one half of each pepper into chunks and the other half into 1/4 inch strips. SET ASIDE! 3. Heat oil in a pressure cooker or large or heavy saucepan over medium high heat until it shimmers, about 3 minutes. Add half the meat and brown on all sides, about 4 minutes. Transfer to a bowl with a slotted spoon. Add the remaining meat and repeat. 4. Add the chopped onions and bell pepper chunks to the pot. Stir frequently until the vegetables soften 4, to 5 minutes. Add the sweet and hot paprika,black pepper, and caraway seed and stir for one minute. Pour in the beef broth. Add the bay leaves, garlic, and tomato paste. Return the meat to the pot and accumulated juices to the pot. 5. Cover and seal the pressure cooker if using ( you could use a pot...i did) and bring to full pressure/heat cook for 20 minutes...if using a saucepan, cook 1-1 1/2 hours. Release pressure and uncover the cooker. Meat should be cooked through and tender. If not recover pot bring back to full pressure and cook for 5 minutes more. 6. Pour soup through a colander into a bowl, leaving as much as the meat as possible in the pot. Pick out the meat cubes in the colander and return to the pot. Discard the bay leaves and the vegetables in the colander as well as in the remaining pot. 7. Add the onion and the peppers from the colander back into the pot and pour the broth right back into the pot. Bring to a boil. over high heat reduce heat to low, and simmer uncovered until veggies are tender, 7-8 minutes. 8. Meanwhile bring water to a boil in a large sauce pan. Add salt and noodles cook until the noodles are just tender. Drain noodles. 9. Spoon 1/2 cup of noodles into each of 6 soup plates. Ladle the hot soup over the noodles and serve at once. Pass the sour cream and cheese at the table. 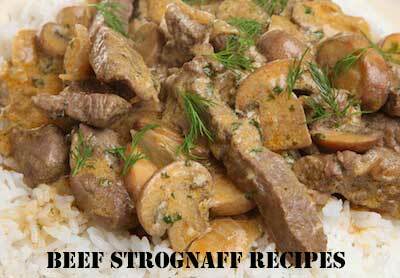 Do you have a basic beef stroganoff recipe to share?